Gonzaga Blanket Brigade - Welcome! * What is the Gonzaga Blanket Brigade? The Gonzaga Blanket Brigade was created in 2004. 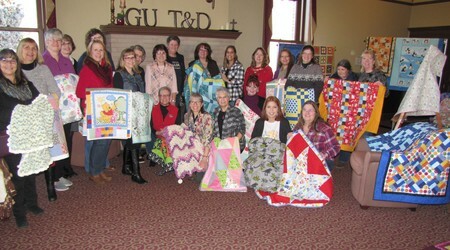 It consists of Gonzaga University employees and friends, who want to make blankets for a worthy cause. 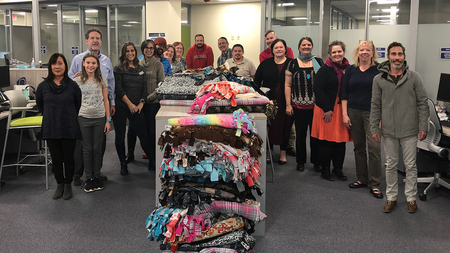 The goal is for group members to make at least one blanket over the course of the year and then these blankets are collected and donated in December. * What type of blankets are needed? Any type of blanket is welcome! Crocheted, knit, quilted, fleece … the list goes on!! We are making blankets for infants to teens and so all sizes and colors are welcome. * Where do the blankets go? Our blankets are donated to the My Bag program. The My Bag program provides backpacks to children who are being taken into foster care. Often these kids are being moved during a crisis and there’s no opportunity for them to gather any of their belongings, and many times there are no belongings to pack. In the case of kids removed from meth houses, they are not even allowed to keep the clothes they are wearing. The backpacks are filled with basic necessities and each includes a new warm blanket. That’s where we come in! The My Bag coordinator has stressed to us how much these kids appreciate having something new they can call their own. These blankets provide a special possession, as well as tangible proof that there are folks out there that care. * How can you help? If you feel like you would be able to make a blanket for our cause, let Laurie Hanlon at x6847 know, and she’ll add you to the e-mail list. We don’t meet formally during the year, but have a potluck in December where we gather and admire all of the collected blankets and then send them off on the next step to their new homes. * When are blankets due? You can donate a blanket any time, but they are given as a group to the My Bag program in early December. * How many blankets has the Blanket Brigade donated thus far?